Our first stop today was Memphis. Memphis was the capital of Egypt during the Old Kingdom period from the first dynasty until around the eighth. Much of what was Memphis in that time is gone, as farmers reclaimed the area after the capital moved. There is speculation that there are plenty of finds just below the surface in many farm fields, but so far there has not been much excavation. They’ve gathered what bits of Memphis they found and put them in an open air museum, with the exception of a statue of Ramses II, which was put under roof to better protect it. That statue was amazing! It was found lying on its back, and that’s how it has remained. The back of the limestone statue was damaged by soil and water, and the bottom part of the statue was missing, but it was amazing what good condition it was in otherwise. You could see the muscles in Ramses’s legs, and his accidental double belly buttons. 🙂 The site was small, but Tim and I had it all to ourselves, so that was cool. Next, we went to Saqqara. Saqqara was a funerary complex built for the king of the third dynasty, Djoser. It sits on 40 acres and has the world’s first recorded building built of limestone. The stepped pyramid on this site is also the first pyramid ever to be built. The entire site at Saqqara was in ruins, but a French Egyptologist devoted 60 years of his life to excavating pieces, numbering them, and rebuilding the site to as close to what it would have looked like as possible. We were able to go into one of the tombs for Djoser’s son-in-law, and the pyramid that was built for King Titi. The carvings inside were beautiful, and some of the original paint remains. Unfortunately, we were not allowed to take any photos inside either of these two locations. 40 columns to represent the 40 districts of north and south Egypt. The stepped pyramid designed by Imhotep. Next, we made a stop at a carpet school where young people go to learn the art of carpet weaving. Some kids as young as 13 go there to begin an apprenticeship to develop as skilled carpet weavers. Once students graduate from the school, they have a loom installed in their home, and whole families become weavers. 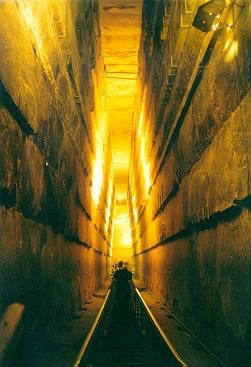 After the carpet factory, it was on to the big one: the Giza necropolis, home to the oldest and only surviving wonder of the ancient world–the Great Pyramid! The pyramid took 90,000 people, 22 years, and 2.3 million blocks of stone to construct. Most of those building the pyramid only worked 4 months out of the year; they were farmers by trade and only worked on the pyramid when the Nile flooded the delta and left them with little farm work. Learning about the different points of the pyramid. Khafre’s pyramid, built on a hill so that it looked larger than his dad’s pyramid. At the top, you can still see some of the casing stones used to make the sides of the pyramid smooth. All the pyramids in this complex were once covered with these, but they were removed and reused elsewhere as time passed. When I talked to my grandmother about her trip to Egypt, she said her regret was opting out of going inside the pyramid. I told her I would be sure to go in to the pyramid in her honor, so we did just that. Unfortunately, no photos were allowed yet again, so we don’t have any photographic evidence other than a picture of Tim and Me at the entrance. What an experience though! There is nothing inside the pyramid except for the empty sarcophagus, so it wasn’t so much what we saw as just knowing where we were. The incline was very steep, and the ceiling was so low that Tim crawled at some points. We were pretty much the only ones in the pyramid (we saw one guy for a minute as he passed us, and another couple was going up when we reached the bottom), and the sounds of our voices echoing off the granite and limestone was a little eerie. It’s still hard to believe we were INSIDE the pyramid–the same pyramid we’ve seen in textbooks and in TV documentaries and movies. Time and again we both said how fortunate we were to have this experience. A photo pulled from the Internet showing what our ascent looked like. After our trip into the pyramid, we walked around the complex and saw the other pyramids. Then we worked our way up from the pyramids into part of the desert just beyond (the Sahara, to be exact). The guide arranged for us to take a camel ride through a bit of the desert to a great location for photographs. After the camel ride, we went back down to the complex to see the other famous monument on the site–the Sphinx. The story goes that a lesser prince of Egypt was hunting near the site and sat down in the shade of the Sphinx’s head (the rest of the body had been buried in the sand), and he fell asleep. He said he had a dream that the Sphinx said if the prince would free him from the sand, the prince would become king of Egypt. The prince got a group of his friends together, and they worked diligently to expose the entire Sphinx again. The prince told everyone about his dream and about his completion of the project. No one could deny what they felt was a message from a god, so they made him king of Egypt. This guy went from having no chance of ruling to becoming king just by digging in the sandbox a bit! On our way back to the hotel, we made two more stops at local shops recommended by our guide to browse for souvenirs. There were a lot of the typical painted pyramids and statues, and an abundance of all sorts of tchotchkes manufactured for tourists, so we weren’t big spenders. After the big lunch we had and the heat we endured today, neither us were very hungry, so we had a light dinner and looked forward to showers and climbing into a better bed than we had last night! Tomorrow we’ll tour the Citadel and the Egyptian Museum! that would have been a highlight for me. That has been on my bucket list before they had bucket lists. I am sure the next couple of days will be just as awesome. Hope you do not fall under the Mummy’s curse. Love the pictures AND the commentary!